Being Frugal and Making It Work: FREE NORAD Santa Tracker - Track Santa on Christmas Eve! FREE NORAD Santa Tracker - Track Santa on Christmas Eve! Can you believe that Santa comes tomorrow night? Here is something super fun for children to do on Christmas Eve before they head off to bed... they can follow Santa and his every move with the FREE NORAD Santa Tracker. You can also track Santa via your mobile phone! How cool is that? 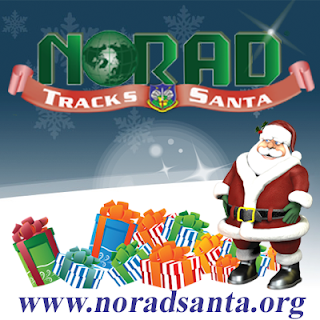 You can also follow NORAD as they Track Santa on Facebook and Twitter! I hope Santa brings you everything you asked for!